An eye stye (medical name is external hordeolum) is a painful red bump on the eyelid that becomes infected and causes a lot of irritation around the eye. The stye is caused by one or more oil glands in the eyelid becoming blocked which causes a buildup of bacteria. The end result is a swollen, and sometimes, painful bump on the eyelid filled up with pus. Eye stye is more than just a nuisance. The red, swollen pimple on your eyelid can become itchy and tender to touch causing a lot of discomfort. The urge to itch or scratch the stye can become unbearable and there is always the temptation to pop a stye (which you should never do!). A stye can sometimes form on the inner eyelid and this is called internal hordeolum. Because stye makes the eyelid puffy and very unsightly, most people want to get rid of an eye stye as quickly as possible. Thankfully, there are many natural remedies that help to remove a stye quicker. These natural treatments for styes increase blood flow to the affected area to speed up the healing process and let the pus drain from the stye naturally. Even if you suffer from frequent outbreaks of styes on your eyelids, there are many natural remedies to help easily prevent styes from reoccurring. Eye Styes are irritating bumps that occur on or within the eyelid around the lash line. Ophthalmologist Dr. Franklin W. Lusby on MedlinePlus states that bacteria infects a blocked oil gland in the eyelid causing the infection.1 This results in a swelling, redness, and pain which resembles a boil filled with icky pus. A severe eye stye infection can turn into a chalazion when the gland becomes totally blocked and a large inflamed lump develops in the eyelid. This can even affect your vision. According to the American Academy of Ophthalmology (AAO), a staphylococcal bacterial infection is the most common cause of the infection.2 The AAO also says that eye styes are not contagious.3 According to WebMD, bacteria from a stye could be passed to someone else, but they would only rarely cause an infection in the receiving person. Should you Pop a Stye? Popping an eye stye may seem like the best way to release the pressure in the swollen bump and drain the pus out. However, if you pop a stye, you run the risk of spreading the bacterial infection and making the inflammation even worse. There are many effective natural treatments and home remedies that can help speed up the healing process of an irritating stye on your eyelid. While it may not be possible to get rid of an eye stye overnight, you can help the infection heal quicker using natural remedies. These natural treatments for styes are much cheaper than pharmaceutical medications, and you probably already have all the ingredients on hand that you need to heal your stye. Of course, if the stye is very infected or has developed into a chalazion, you should see your local doctor or ophthalmologist. Let’s look as some of the most effective natural ways to help get rid of a sty quickly. You can treat eye styes using warm compresses or soaked tea bags – green tea and chamomile tea are particularly effective against styes. The heat from the compress or warm tea bag helps to increase blood circulation around the stye to speed up the healing process and reduce pain and inflammation. Dip a washcloth in warm water, wring out the excess water and place it over the stye for a few minutes. Repeat this three to four times per day until the stye is gone completely. Once the pus begins to drain, wipe it away with a clean cloth. Similarly, you can soak a tea bag in hot water for five minutes, press out the excess moisture, and place the tea bag over the affected eye for a few minutes at a time. Apply the warm tea bag a few times every day until the infection in your eyelid has disappeared and you no longer have any irritation. Aloe vera is one of nature’s miracle healers – it has amazing healing benefits and uses for your skin. You can use the anti-inflammatory properties of aloe vera to reduce redness and swelling that an eye stye causes and speed up the healing process. Aloe vera is also one of the best remedies to get rid of conjunctivitis. To treat an eye stye using aloe vera, simply cut a piece of leaf from an aloe plant and give it a squeeze until it releases the gel. Alternatively, purchase organic pure aloe vera gel (like this one). Smear the gel over the stye and let it be for about 20 minutes. Wash the gel off with warm water and pat it dry with a clean towel. This may be done three times per day for up to five days, as needed. You will find that aloe vera is a great natural remedy for other skin conditions that are associated with inflammation, itchiness, redness, and swelling. Turmeric is more than a mere spice, it has amazing healing powers thanks to its anti-inflammatory and antibacterial properties. You can use a turmeric paste on your stye to reduce pain, redness, and swelling. Create a thick paste of ground turmeric and water. Dab a clean cloth into the paste and apply over the red bump on your eyelid for about 20 minutes to help reduce the inflammation. Apply the remedy three times per day until the stye has healed. Another natural treatment to help get rid of swelling and irritation of styes is to take a teaspoon of turmeric powder and dissolving it in 2 cups of boiling water. Let the water boil for two minutes. Allow the turmeric water to cool down and strain the water well using a fine cotton cloth until the turmeric particles are removed. Dip a cotton ball in the turmeric mixture and use it to wash the stye area three times a day. Repeat the process until you no longer have a pus-filled bump on your eyelid. You can also mix a tablespoon of turmeric into a glass of milk or water and drink it each day to improve your body’s ability to heal on a systemic level. Turmeric also has many health benefits when cooking with it. So, try to incorporate turmeric into your daily diet to help boost your general health. Use the anti-inflammatory properties of castor oil to ease the irritation and discomfort caused by a stye. Castor oil can also help to heal the infection faster. Here is how to use castor oil to fight the bacteria causing the stye infection and help the eye heal quicker. Wash your eye with warm water and dry it with a clean towel. Apply two to three drops of castor oil to the stye itself to allow its antibacterial properties reduce the infection and inflammation on your eyelid. Repeat three times per day until the stye shows signs of improvement. Potatoes are not only delicious but they are packed full of vitamins and minerals that can benefit your skin. Thanks to the natural cleansing properties within their “meat”, you can use potatoes as a natural home remedy for treating eye styes. Wash and peel a potato and grate it. Put the grated potato into a cheesecloth to create a soothing and cooling compress. Place the cloth over the affected eye for a few minutes at a time to get rid of the pus. Rinse your eye clean and dry it off with a clean towel. Repeat two or three times per day until the stye clears. Yet another natural remedy for styes that can be found in your spice cabinet is coriander seeds. These poses anti-inflammatory properties and you can use them to reduce swelling and healing time of styes. Do this three times per day until the stye is healed and you no longer have any irritation around your eyelid. Guava leaves are another one of nature’s anti-inflammatory wonders that can also do wonders to help clear up styes quickly. To use make your own guava leaf home remedy for treating styes, you should soak a few leaves in warm water for a few minutes. Place the guava leaf on your stye as a compress for up to 10 minutes. Repeat this once or twice a day to get rid of the bacterial infection in your eye quicker. You can use goldenseal or eyebright as natural antibiotics to fight the bacterial infection that is causing your eye stye. These herbs are natural bacteria fighters and can also help to reduce painful swelling around the eyelid. Note: be careful not to place eyebright infusions into the eye itself—this treatment is intended for external styes only. Using a dropper, place one or two drops of goldenseal extract directly onto the stye four times daily to fight the infection and reduce swelling. If using eyebright, you can create an antibacterial infusion by boiling a one-quarter cup of dried eyebright leaves in two cups of water. Cool and strain the mixture, then soak a cotton ball in the infusion and dab the affected eyelid. Repeat this a few times daily to decrease the inflammation and pain. There are other useful uses for Goldenseal and Eyebright which I’ve mentioned in my eBook Herbal Remedies Guide. This guide will teach you how to treat common ailments using herbs. Cloves also contain antibacterial properties which can help to get rid of a stye and reduce the swelling of an inflamed eyelid gland. Soak a tablespoon of whole cloves in a cup of hot water for five minutes. Soak a clean washcloth in the clove extract and place it over the affected eye for five minutes at a time. 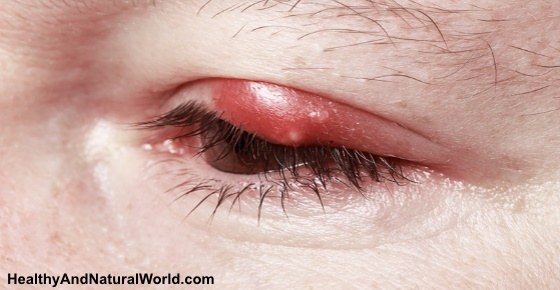 This natural remedy can help to reduce the swelling of the stye, increase blood circulation to the affected area around the eye, and help the pus drain naturally. You should find that the clove compress helps to reduce pain and discomfort caused by a stye. You can use a baby shampoo to keep the area around your eyes cleaner to help the styes heal faster. Baby shampoo is ideal for cleansing eyes because its pH level is intended to make it non-irritating when it gets into the eyes. Make sure to use pure, organic and all natural baby shampoo like this one. To treat your stye, place a few drops of baby shampoo into a cup of water, then dip a clean cloth or cotton puff into the mixture and use it to dab at the stye. Then rinse the eye clean with plain water and pat it dry. This can be done several times per day, and should help to clear the stye within three or four days. Keeping eyelids clean and free of build-up and debris is key to preventing styes from occurring in the first place. Here are some helpful tips on how to prevent your eyes becoming infected and styes developing. If you wear makeup on your eyes, never apply it too close to the lash line, and make sure you use good, sanitary cosmetics – nothing old or of questionable cleanliness. Never share makeup with anyone, as bacteria can easily be transferred from person to person and may cause your eye to become infected. When showering or bathing, clean eyelids with your eyes closed using diluted baby shampoo or another mild cleanser and a clean washcloth. Rub the eyelids with the cleanser, then rinse well with clean water. As a general note, if you have any concerns, you need to see your doctor. Are styes in the eye contagious? J Food Biochem. 2010 Mar; 34(s1):61-78. I routinely had styes through high school and they drove me crazy. It would start with the irritation, the swelling and so on. I went to an old family doctor for something else and as I was there he noticed the stye and said we can do something about that. He told me I have a Riboflavin, B2 deficiency. I picked up some at the drug store and within a day or so, it was gone. I did not take a pill everyday, but when I would start getting the symptoms, I would take a pill for a few days and no stye. I am now 65 and a couple days ago I woke up with the irritation on my right lower eye lid and sure enough, I had the small pimple thing starting. I immediately found my B2 pills and took one and and for a couple days another one. As in the past, the stye did not develop and went away. It worked for me 50 years ago and this still works now. How many milligrams or so do you take? My wife has a heck of a stye for a few days now and has been using the stye medication from the pharmacy. She found out through the internet that Castor oil is good for it as well as green tea/chamomile tea compresses which she will do. However, if B2 vitamin is the remedy for you and will buy the B2 pills for her today. Like to her more from you in this regard. Thanks for Cicuta.